Follow these steps to see how Nieves used gel-polish and gold foil over an acrylic set to create a colorful antique glass effect manicure. 1. Clean and prep the nails for acrylic application. 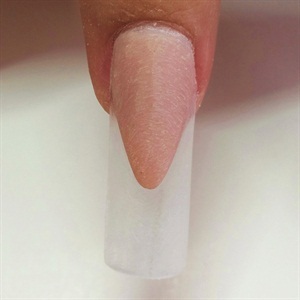 Sculpt the nail extension in a square shape using cover pink and apply white acrylic to the nail tip. 2. Apply black-colored acrylic to the bottom half of the free edge. On the accent nail, dab a mix of black and white acrylic to create a faded and washed out effect. 3. Use a brush dipped in a little monomer to apply additives over the French tip and the accent nail to get a rainbow, stained glass look. 4. Encapsulate the effect with clear acrylic. Once it cures, buff all the nails and wipe the nails clean. Using a detail brush and black gel-polish, create intricate swirl designs along the French tip and over the entire accent nail. Cure for two minutes under a UV light. 5. While the gel-polish is sticky, press gold foil paper on the design and pull it off quickly. 6. Finish the look with gel-polish top coat and cure for two minutes under a UV light. 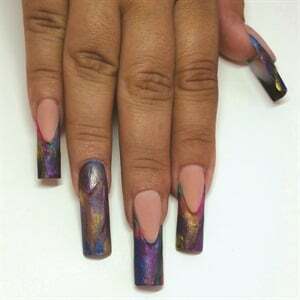 Use alcohol to remove the sticky layer on the nails and apply cuticle oil.